How can teachers of Latino English language learners actively engage their students' families in helping English language learners (ELLs) succeed in school? In this powerful book, David Campos, Rocio Delgado, and Mary Esther Soto Huerta provide guidance and resources to help teachers communicate and collaborate with the families of Latino ELLs. Outline a framework that educators can use to create a "campus task force" for engaging Latino families in student learning. The more families of Latino ELLs learn about the curriculum, policies, and procedures of their children's schools, the more comfortable they will be collaborating with teachers. Likewise, the more educators learn about their students' backgrounds, the better able they will be to help them in the classroom. This complete resource will enable educators to work diligently and harmoniously with students' families in the service of what really matters: the academic success of Latino students. "The book gives lots of ideas of simple ways to connect with Latino families, such as assigning students to research famous Latinos or posting phrases around a school in both English and Spanish. ... The book also describes more substantial and coordinated efforts to engage Latino parents, such as identifying community resources to support parents and students and forming a task force to improve Latino engagement." —As first appeared on Edweek.org, Learning the Language, August 9, 2011. Reprinted with permission from Editorial Projects in Education. "Authors David Campos, Rocio Delgado, and Mary Esther Soto Huerta have put together a wonderful guide to help educators reach out to parents of students who are learning English. This book also explores why, culturally, Latino parents may seem hesitant about connecting with their kids' schools, and presents strategies educators can use to approach these parents effectively." —Excerpt originally appeared in School Library Journal's enewsletterSLJTeen. Reprinted with permission from School Library Journal. "Reaching Out to Latino Families of English Language Learners is a necessary and useful tool for practitioners. The authors—David Campos, Rocio Delgado, and Mary Esther Soto Huerta—provide a guide for educators that can aid them in reframing the ways they perceive, approach, and engage with Latino ELs in their classrooms." 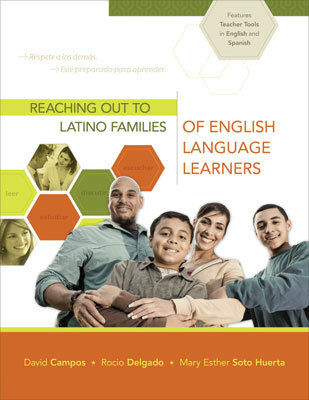 "Reaching Out to Latino Families of English Language Learners." Reprinted by permission of Taylor & Francis Ltd.
"While this book would benefit teachers interested in increasing Latino parent engagement and would be especially useful for individuals who are relatively unfamiliar with Latino culture and the Spanish language, its easy-to-use guide and vast appendix make this a book that all educators who work with Latino English learners should have on their shelf." Title III/Access to Core Instructional Coach, and adjunct professor, Los Angeles, Calif. This review first appeared in the International Journal of Multicultural Education.